Why Bad Pruning is Like a Bad Haircut ~ 5 Pruning Tips That Will Save Your Shrubs! The one thing you can’t do with a bad haircut is uncut it, so you just have to wait for it to grow out before you can fix it. That’s how expert gardener Carol Chernega views the art and science of pruning a shrub. If you trim it the wrong way, you’re only compounding your problems, but learning the right way is not nearly as difficult as going to cosmetology school. “Instead of giving your shrubs a bad haircut, it’s actually very simple to give them a day at the spa, instead,” said Chernega, producer and star of the DVD Pruning Shrubs with Your Personal Gardener (www.onegardenatatime.biz). Her tips on pruning might not only change your style, but help transform your garden and landscaping, as well. Know What You’re Pruning – Before you make your first cut, look carefully at your garden and identify what you’re going to be pruning. Use the Internet to identify them if you don’t already know. You want to learn how the shrub should look so you can prune it to maintain that natural shape. Cut Back to the Branch -- Always cut back to a bud or branching point. Never leave a long stub. A stub will not only look ugly, but it will also invite insects and disease that could cause long term problems. Cut the Dead Weight First – Before you cut anything else, cut out the dead or broken branches. Sometimes removing a dead branch will leave a big gap, so by doing them first, you’ll be able to tailor the rest of your pruning to compensate for that gap. Crossing Over – After you eliminate the dead branches, next you want to target crossing branches or branches that are likely to cross in the future. Once they start rubbing against each other, they’ll leave a wound that will invite insects and disease, so you want to eliminate that threat. Cut With the Flow -- Finally, cut out all branches that are not going in the natural direction of the plant. This is good for the health of the plant, as well as the look of your garden. Carol Chernega has worked as a professional gardener since 1992. She's been visiting England for fifteen years, fueling her passions for English gardens and literature. This led to her being chosen as the first International Visitor for the Jane Austen Society of North America (JASNA). This honor meant Carol worked for two months in Jane Austen's garden in Chawton, England. During that experience she learned why the English deserve their reputation as excellent gardeners. She now incorporates that knowledge into her pruning workshops. 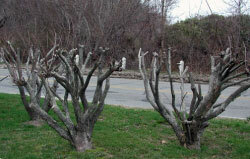 2 Responses to Why Bad Pruning is Like a Bad Haircut ~ 5 Pruning Tips That Will Save Your Shrubs!